Join us at one of our photo-centric events, meet other local photo enthusiasts, and bring home fresh portfolio-worthy shots. Looking forward to seeing you there! January 13, 2015 at 6:00 PM - John & the Milford Photo crew gathered for the opening of John's show, "Detailing" at Café Atlantique. Milford Photo's John O'Neil exhibited 17 of his photographs of details of classic cars through January 31st at Café Atlantique, across the street from Milford Photo in downtown Milford. The Exhibit was called "Detailing" with an opening on January 13 from 6 to 8pm. 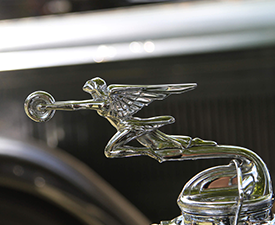 The images show details of classic cars — hood ornaments, logos, emblems, grills. Details that appear to be small works of art designed with great care in an age when automobiles often seemed larger than life. The images were captured with a Canon 7D and Canon 24-105mm f4L lens over several years at the Southbury Training School Car Show. The photographs were printed and framed by Milford Photo. March 23, 2014 - A black-and-white photo called Irrigation, which Wilton photographer Daryl Hawk called “technically perfect in every way,” was selected Best of Show at Focus ’14, the annual photography exhibition presented by the Wilton Arts Council. The winners were celebrated at a reception Friday evening, March 14, at Wilton Library where the 214 photos will hang through March 29. Many of the photos are for sale. Reported by Jeannette Ross for Wilton Bulletin. March 8, 2014 - Alex Burdo, 17, isn’t your typical teenager, nor is he a typical Make-A-Wish Foundation beneficiary. Not only did he defy statistics and steer away from asking for a trip to Disney — one of the most common requests, foundation representatives said — he took the opportunity at a recent event first to talk not about himself or the disease he’s been battling for five years, but rather to talk about the need to help all child cancer patients. “There are so many kids with childhood cancer,” Alex said Friday evening, when he joined friends and family at Milford Photo to receive his Make-A-Wish wish — a high-tech Canon camera. Alex, a Fairfield resident, is a birder and a photographer first; a very intelligent young man who attends Hopkins School in New Haven second, and third, a young man with cancer. When he was 12 years old he was diagnosed with osteosarcoma, a form of bone cancer. He’s had numerous therapies and 15 surgeries, and he’s been robbed of bone in his body, much in the shoulder area. Alex became fascinated with birds when he was 5 years old. When he was very sick, the hobby helped him through many hard times, and thinking about the birds he had yet to see, and photographs he had yet to take, has helped him through some trying cancer treatments, he said. Alex radiates intelligence and goodwill when he enters a room. But because the young man is modest and humble, as friends said, the best way to learn about him is through the words of those who know him. Jay Gepfert is a wish granter who met Alex three months ago when he went to the family’s home to talk about Alex’s wish. Months ago when Alex was talking to Gepfert and co-wish granter Laura Loretan about the camera equipment he’d like to have, he looked at them several times and asked if he was requesting too much. Nelson North, director of the Connecticut Audubon Society in Fairfield, has known Alex for seven years, since the young man started visiting the Audubon. A few years ago, the Audubon nominated Alex for an L.L. Bean Outdoor Hero award, which Alex won. Alex has his own birding blog, floridascrubjay.wordpress.com, where he posts news about his sightings. He’s also involved in his community, raising awareness about birds. Last year, the Audubon and a group of volunteers installed birdhouses, bird feeders and other bird-attracting devices in Alex’s back yard so he could look out his window at the winged world as he battled his disease. Joan Winter handles communications at the Fairfield Audubon, and she has a special bond with Alex. She went through chemotherapy shortly before he did, and she knew what he was up against. Alex is good friends with Winter’s daughter, Abbie, who went to school with Alex at the Unquowa School in Fairfield and took part in efforts to cheer him while he was very sick. The class made a baseball mobile out of Red Sox cards, because he loves the Red Sox, Abbie said. Alex’s grandfather, Jim Orrico of Fairfield, has traveled with Alex to spot birds, from two-degree locations in Ontario, to 10,000 feet up in the mountains of Arizona, to the Rio Grande, where they looked across to Mexico. The two are planning a trip to the Bahamas and Florida, where they hope to find and photograph the Florida Scrub-Jay. In addition to his blog, Alex has had his photographs published in birding magazines, his grandfather said. “Many great bird authors know him,” Orrico added. Debbie Artinian, a Make-A-Wish wish granter, said when the agency learned that Alex’s wish was to be outfitted with a top-notch camera for bird photography, they went to Jim Wilson at Milford Photo to find out just what was best for a young man with limited strength, as a camera with a powerful lens is fairly heavy. In addition to the Canon 5D Mark III professional camera and special high-power lens, Wilson suggested a lightweight tripod that will help Alex get the shots he’s looking for. Altogether, the camera package is worth close to $10,000, and was made possible by Make-A-Wish, combined with donations from Canon and Milford Photo. Wilson contacted Canon for the equipment, and Wilson made his own contributions, telling Alex to pick out any camera bag in the shop he wanted. He may also take photo classes at the store whenever he wants. Pete Essex, representing Canon, said Canon was impressed with Alex’s wish. Noble Proctor, a professor from Southern Connecticut State University and an author, joined the event Friday and handed Alex several birding books and a collection of bird photographs. No one had to tell Alex who the professor was: “His reputation precedes him,” Alex said. Alex is the son of Gaby and Gerry Burdo, and has two sisters, Olivia, 10, and Isabelle, 15. Alex plans to enter the biology and environmental fields someday. Along with advocating for research into childhood cancer, Alex said he also wants to focus his efforts on climate control and the environment. “I’m looking to help the planet that has sustained me and my family,” he said. As the Make-A-Wish gathering came to a close Friday evening in Milford, Alex looked at the agency wish-granters who had become a little part of his life in the past few months. Jim Wilson of Milford Photo hands a tripod to Alex Burdo of Fairfield, who received camera equipment from the Make-A-Wish Foundation Friday. Alex has the camera he received strapped around his neck.